An eclectic mix of kitsch and contemporary and antiques and fabric-festooned decadence, all for a reasonalble price tag. Award winning English cooking using fresh, local and organic produce. Charming rooms with fourposter beds, free tanding baths, open fires and indulgent room service. Pets are allowed with prior consent, charges apply. Children of all ages welcome, babysitting services are available as are monitors and cots. A real highlight is the bargain hunting anituques market in Swaffham every Saturdays. Wander around the beautiful gardens, or head further afield to the historic Brecks. No better way to see the historic Brecks than on horseback, head to nearby Bridlewood Livery & Riding Centre. Situated in a conservation area you are sure to see a range of birds and animals on your daily stroll. 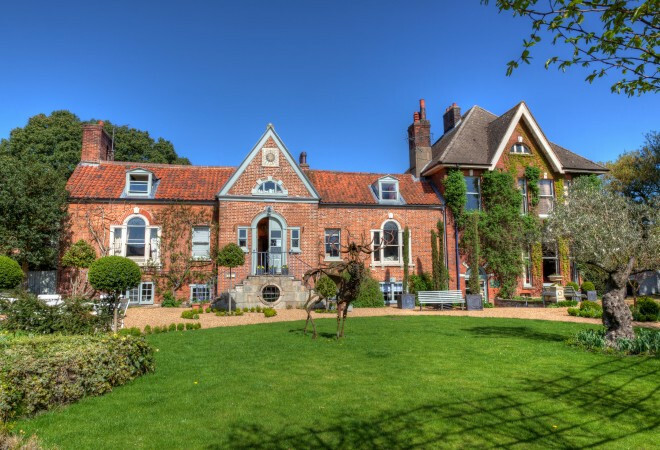 "Expect a cheerful welcome at this unexpectedly quirky and ecologically-minded establishment in a bustling Norfolk town." "I liked Strattons. I liked its food, I liked its confidence in its own sense of style." You'll find eye-catching murals, humorous sculptures and painted canvasses all over the property and grounds.